Scientists have unlocked secrets about the dun coat coloring that has served wild horses through the millennia, providing fresh insights into horse domestication. The researchers set out to learn more about why horses have lost their wild-type camouflage – pale hair with zebra-like dark stripes known as the Dun pattern. Scientists have discovered not only what causes the dun pattern, but why it has been lost in most horses. The results, published today in Nature Genetics, reveal a new mechanism of skin and hair biology. The work was carried out in an international collaboration led by groups at Sweden’s Uppsala University, and the Huntsville Institute of Biotechnology in Alabama. Pale hair colour in dun horses provides camouflage as it makes a horse in the wild less conspicuous. In contrast, domestic horses, as well as many other domestic animals, have been selected over many generations to be more conspicuous, more appealing, or simply different than the wild type. The pale hair colour in dun horses does not affect all parts of the body; most dun horses have a dark stripe along their back, and often show zebra-like leg stripes. However, most domestic horses are not dun and show a more intense pigmentation that is uniformly distributed. “Dun is clearly one of the most interesting coat colour variants in domestic animals because it does not just change the colour but the colour pattern,” says Uppsala University’s Leif Andersson, whose group led the genetic analysis. “We were really curious to understand the underlying molecular mechanism why dun pigment dilution did not affect all parts of the body,” he said. 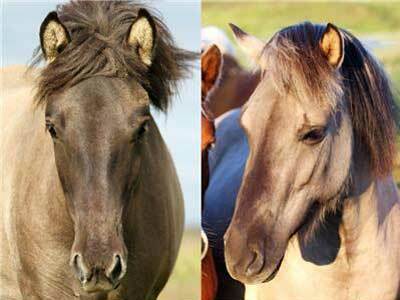 Freyja Imsland, the lead author for the genetic analysis and a PhD student in Andersson’s group, said: “Unlike the hair of most well-studied mammals, the dilute coloured hairs from dun horses are not evenly pigmented the whole way around. “They have a section of intense pigmentation along the length of the hair, on the side that faces out from the body of the horse, whilst the rest of the hair has more or less no pigment. Genetic analysis and DNA sequencing revealed that dun versus non-dun colour was determined by a single gene that codes for the T-box 3 (TBX3) transcription factor. In humans, inactivation of the TBX3 gene causes a raft of birth defects known as Ulnar-Mammary Syndrome. But in horses that have lost their dun colour, TBX3 mutations do not inactivate TBX3 protein function and instead only exert an effect in the growing hair. Greg Barsh, whose group led the tissue analysis, said previous studies in humans and laboratory mice showed that TBX3 controlled several critical processes in development that affected bones, breast tissue, and cardiac conduction. The team discovered two forms of dark, non-dun colour – non-dun 1 and non-dun 2 – were caused by different mutations. Freyja Imsland says non-dun horses have much more vibrant colour than dun horses. To understand how TBX3 affected hair colour, they measured TBX3 distribution in individual hairs relative to other molecules previously known to regulate pigmentation. “A senior scientist in Barsh’s group, Kelly McGowan, said: “In growing hairs, TBX3 mirrors the distribution of melanocytes, the cells that produce pigment. The results of the study indicate that the non-dun 2 variant occurred recently, most likely after domestication. In contrast, both the dun and non-dun 1 variants predate domestication, which is evident from the observation that ancient DNA from a horse that lived about 43,000 years ago, long before horses were domesticated, carried both dun and non-dun 1 variants. Andersson said this showed that horse domestication involved two different colour morphs – dun and non-dun 1 – and future studies of ancient DNA would be able to reveal the geographic distribution and the abundance of the two morphs.